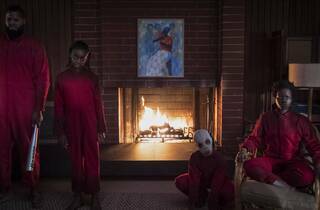 Jordan Peele is back with more terror—but slightly less edge. You lean forward while watching Us, the new horror film from Jordan Peele, since his last one, Get Out, rewarded that kind of attention. So, when his movie tells us early on that there are thousands of miles of tunnels under the United States with “no known purpose,” you squirrel that away in your brain, knowing it’ll be important later. When Peele shows us a TV commercial for that weirdly faceless 1986 publicity stunt Hands Across America—or when there are a bunch of bunnies in cages or an apocalyptic Bible quote on a sign—those details get stored away, too. But none of it quite adds up to the nightmare in your head. Us is too confidently made, too expert in its scene-to-scene command, to call it an example of sophomore slump. Still, after the film reveals itself to be the home-invasion thriller it is (and then the lesser Invasion of the Body Snatchers it becomes), you feel a slight letdown. Peele, as ever, blends comedy and screams like a champ—muscles he toned on TV’s radical Key & Peele—and his actors are terrific. After a brief mid-’80s prologue in which a lonely kid (Madison Curry) in a Michael Jackson T-shirt encounters something awful in a beachside carnival fun house, she becomes the grown-up Adelaide (a finely haunted Lupita Nyong’o), now with two children of her own and a dad-joke–dispensing husband (Winston Duke). For some reason, they’ve bought a summer house by that same beach, and it’s where Adelaide must return—unless, of course, the beach comes to her. “There’s a family in our driveway,” notices her son one night, pointing at their four red-clad doppelgängers, and the plot kicks into overdrive. Your mind will reel at the sight of these uncanny doubles, wielding sets of extra-large golden scissors. (Details like that are just strange enough to distract from the film’s overall shapelessness.) Peele gives everyone in his cast a second role, and they twist their bodies into impressively gymnastic, feral crouches. Nyong’o is especially good, her evil twin speaking in a strangled croak that sounds like an inhalation of breath rather than an exhalation. (Try it.) “We’re Americans,” she tells the family pinned in the living room, a line that’s juicy enough for any stray cultural critics in the crowd but not as earned as it should be. Pointedly, this double-family siege is also happening to a white household nearby (Elisabeth Moss is peerless when it comes to dispensing creepy smiles while applying lip gloss), and Peele’s shift away from Get Out’s expressly racial material feels like a smart move. But as Us lunges into its technically assured chase section—composer Michael Abels, working with an orchestral spin on Luniz’s throbbing “I Got 5 on It,” deserves much of the credit—it loses some of the distinctness we’ve come to expect from this extraordinary new voice. Us feels like John Carpenter’s minor 1980 film The Fog, his disappointing follow-up to Halloween. Anticipate a rebound. Horror has long exploited the idea of brutal self-replacement, and in this case, there’s a generalized dread of something—maybe it’s our online personae or red-state America or some other underclass of our own avatars, rising up in rebellion. 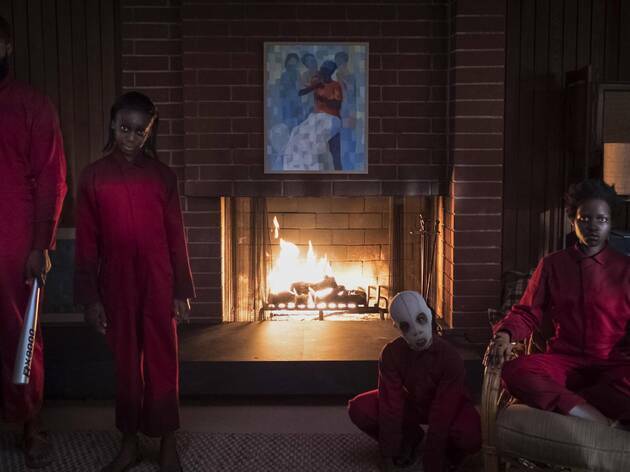 Us becomes what you bring to it, which makes it less of a vision, though one with enough subterranean twists for viewers to want to give it a second whirl. One of the best modern Horror movies. Lately Horror movies have been mediocre with the exception of The Conjuring 1&2, Annabelle Creation, Get Out and a few more but Us brought back a lot of great Horror movie elements and add something completley new. It tells the story of a family who suddenly discovers doppelgangers that look exactly like them and discover something much more is going on. It has thrills, edge of seat moments and one of the best ending's in a Horror movie ever. It is a great movie and If you have not seen it you definetly should. Even if you don't like horror movies its too good to pass up.